The following is a review of the Weiss Walkie Dog Training Leash. Are you looking to stop your dog from pulling you along on his or her walk? This is a great new product for people looking to leash train your dog in a safe and effective manner. The Weiss Walkie is great for your average dog walker, and also great for animal shelter workers. It’s immediately accepted by dogs with no training necessary. It will make your walks more enjoyable for you and your dog! How Does The Weiss Walkie Work? The Weiss Walkie works by wrapping around your dog’s barrel and attaches to the buckle collar. It’s design incorporates principles of canine physiology and psychology to quickly and humanely stop pulling. By applying slight pressure around your dog’s barrel, it naturally decreases forward movement. It’s great for dogs that are easily excited as it serves to naturally calm and relax the dog. This is not a replacement for a good training program, but it is a great supplement to make your time with your dog more enjoyable for you both! What Sizes Does The Weiss Walkie Come In? 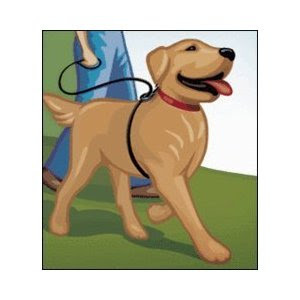 The Weiss Walkie Dog Training Leash comes in 4 colors. Black, Red, Hunter Green and Sky Blue. This product is proudly Made in the USA!